The 4-Tine tiller is a versatile garden tool. The tines of the 4-Tine tiller are forged and thin. 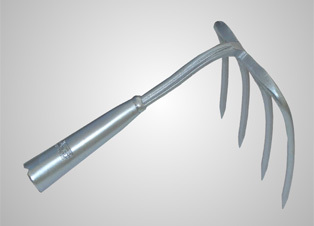 Wet soil doesn't stick and therefore the tiller can be used very early in spring when it's still too wet to work with other garden tools.The angle between the tines and the ferrule makes it suitable for use with either a long or a short handle and comfortable to work in raised beds.